The Archdiocese of Ibadan will hold its Eucharistic Congress from 9 -16 September 2012. Many celebrations are planned for the occasion, including the ordination of three more priests for service in the Archdiocese. They are Rev John Ademoye from Christ the King parish, Gabriel Udoh from Church of the Ascension parish, Bodija, and Michael Woods from St. Michael’s, Odo-Ona-Nla. As Archbishop Felix Alaba Job who, on his appointment as bishop in 1971, was the youngest in the world, moves towards the mandatory retirement age of 75 years in 2013, he has decided to show his gratitude to some of those who collaborated with him during his Episcopacy. So it was with great joy that the faithful heard of the conferring of various ecclesiastical honours on priests and Sisters who have served the Archdiocese during his term of office. Five diocesan priests have been appointed Monsignors. The Vicar General of Ibadan, Rev Fr Dr Peter Odetoyinbo will be Prelate of Honour to His Holiness. The other four priests will have the title of Chaplain to His Holiness: Rev Fathers Peter Ajibola, Theophilus Fadeyi, Joseph Idowu and Peter Otubusin. Four members of the Society of African Missions [SMA] were honoured with the Papal Award, ‘Pro Ecclesia et Pontifice’. This is “the highest honour given to Consecrated Persons”. The four SMA priests are Fathers Fintan Daly, James O’Hea, John O’Hea and Oscar Welsh. Father Fintan Daly was appointed to Ibadan after his Ordination in 1964 and is still there, having served in many different roles in the Archdiocese, including Vicar General and Rector of St. Theresa’s Minor seminary at Oke-Are. He taught in the Seminary for 24 years, from 1966 -1990, being Rector from 1979 to 1990. After stepping down as Rector, Fr Fintan moved into full time pastoral work and served in Our Lady of Fatima Parish, Eleta until 2002. He was then elected as Deputy Regional Superior and moved to SMA Regional House in Challenge, Ibadan where he also took charge of St. Leo’s Parish which is attached to the SMA house. His three-year term as Deputy Regional Superior ended in 2005 but Fr Daly remains parish priest of St. Leo’s, continuing to develop new outstations in the area. One of them, Good Shepherd, is now a parish in its own right. Fr. James O’Hea came to Ibadan in 1952 and gave faithful and unbroken service there for 56 years. His first appointment was to St. Theresa’s Seminary where he taught for 4 years. Eight of his students were later to become Bishops, among them being H E Cardinal Okogie and Archbishop Job. Fr O’Hea was, for a period, Administrator of St Mary’s Cathedral. He also served in the following Parishes: Holy Cross, Ikire; St. Cyprian’s Oke Offa; St. Joseph’s Oke Ado; St. Gabriel’s Mokola and St. Patrick’s Bashorun. Despite a serious illness several years ago, Fr James is now living in active retirement at the African Missions, Blackrock Road in Cork where he keeps up to date of all that is happening, both in Ireland and his beloved Nigeria. Fr. John O’Hea, brother of Fr James, came to Ibadan in 1961 and his first appointment was to Fatima College, Ikire. He also taught at St. Theresa’s Seminary. Then he was Parish Priest at St. Anthony’s, Iwo, and then at St. Cyrpian’s, Oke Offa. Next he was Administrator of the Cathedral and then he was Parish Priest of St. Peter’s Apata. 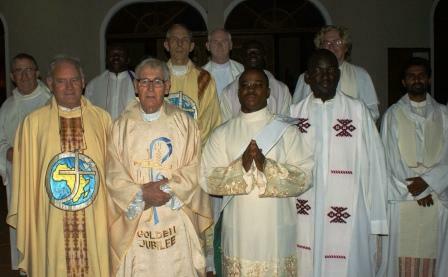 Fr John is pictured here, 2nd from left in front row, after the Mass to celebrate his 50th anniversary as a priest which took place at the SMA Formation House in Bodija, Ibadan in 2010. Read homily of Fr Daly for the Golden Jubilee here. Convinced that the greatest need in the Archdiocese was the handing on of the faith to children, Fr John has, for the past ten years, devoted all his energies and talents in training catechists and organising the teaching of religion in parishes and promoting Sunday School for children. To that end he has developed a Catechetics Syllabus for use throughout the Archdiocese and has also written the books for the Catechists and catechumens to use. The cost of these publications he bears himself through family, friends and other benefactors. Fr John also served as Vicar General to Archbishop Job. Fr. Oscar Welsh came to Ibadan the same time as Fr. John O’Hea. He was first appointed to Holy Cross Parish Ikire. In 1963 because of increased secretarial and administrative work to be done in the Diocese Bishop Richard Finn appointed him as his secretary. His efficiency was greatly appreciated by Bishop Finn and also by Bishop Job who took over from Bishop Finn in 1974. Fr. Welsh continued his efficient work as Secretary until 1980 when he was recalled by his SMA Superiors to be the Provincial Bursar though he continues to be of assistance to Ibadan in various ways. Archbishop Job has shown his appreciation by seeking a Papal award for a man, who though many years in Ireland, continues to serve the work of mission in Africa. Three Dominican Priest were also given Papal Awards. They are Fr. Justus Porkswinski, Fr. Peter Otilio and Fr. Edward Riley. Two Nigerian Sisters of Our Lady of Apostles [OLA] were also honoured. They are Sr. Nuala Edozien and Sr. Rosaline da Silva. Three Medical Missionaries of Mary [MMM], two Sisters of the Immaculate Heart of Mary [IHM], one Sister of St Louis and a Sister of the Eucharistic Heart of Jesus were also honoured. The conferring of the awards will take place on 15 September, the same day as the Priestly Ordination ceremony which will take place in Ss. Peter & Paul’s Seminary, Bodija, Ibadan.